5-room Villa Summer, house for 11 people, 90 m2, comfortable and modern furnishings.Living/dining room with satellite TV. Smoking not allowed. Internet (Wireless LAN [WLAN]). 1 sofa bed.Sleeping room with 2 single beds. Sleeping room with 1 double bed. Sleeping room with 1 single bed and 1 double bed. 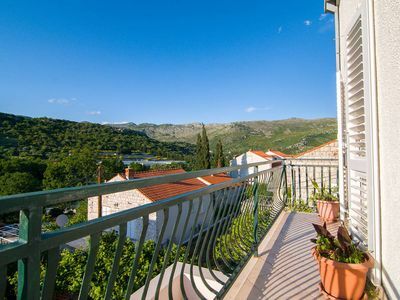 Sleeping room with 1 single bed and 1 double bed.Open kitchen with oven, grill, dining table, dishwasher and fridge.Bath-room, shower and shower/WC.Terrace.Other equipment: hair dryer, iron, washing machine. Large, beautiful villa Villa Summer.House Equipment: air conditioning, washing machine (private use).Access & Parking: private parking. 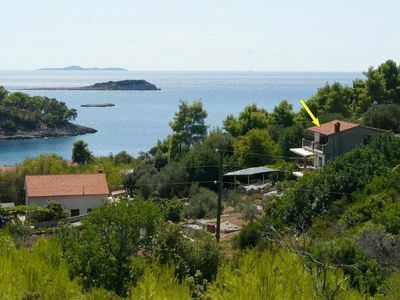 Situation: quiet position by the sea.Surroundings of the house: garden (private use), swimming pool (private use, heated, open from 01.04. untill 01 .11. 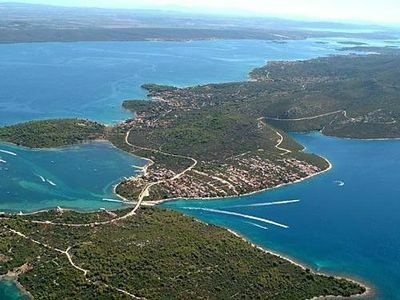 ), outside shower (private use).Facilities and distances: supermarket 1.5 km, restaurant 500 m, rocky beach 10 m, bus stop 1 km. Please note, nearby is an ein airport/airfield in 33 km.